How do I verify the download file? Is ZecWallet a light client? How large is the blockchain? Can I change the location of the data directory? Can I move the params directory? Can I use funds with zero confirmations? Can I use a custom fee? What's the difference between Transparent, Sprout and Sapling addresses? How long does a Sapling transaction take? Where is the default data directory on each platform? Can I use ZecWallet with an external node? How do I find the version of zcashd that I am running? Does ZecWallet work on testnet? Does ZecWallet support payment disclosure? Does ZecWallet support viewing keys? How do I use the zcash-cli command? Why does my change go to a new address? Will ZecWallet remember my outgoing shielded sends? How do I read a memo? Can I use ZecWallet with a hardware wallet? Can I remove an address from the wallet? Can I import private keys from a recovery phrase / BIP39 Mnemonic? Can I export a BIP39 seed phrase? Can I export the Sapling HD seed? Can I import the Sapling HD seed? Can I mine with ZecWallet? How do I upgrade from WinZEC / zcash4mac / zcash4win? 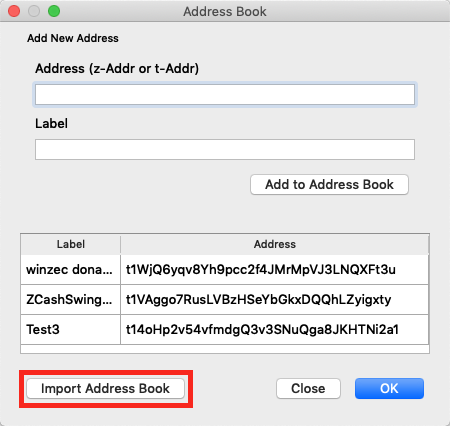 Can I import the WinZEC address book? In what languages is ZecWallet available? Why are there references to both zec-qt-wallet as well as ZecWallet? ZecWallet is available to download from the Zcash Foundation GitHub repository. The releases page lists the latest available downloads for each platform. The Android application, which is still in beta, may be downloaded from here. See the installation section for more details specific for your platform. Starting from v0.5.10 all ZecWallet releases are signed. You may download the detached signatures on the releases page and verify that the software was signed with the published public key. In addition, each release contains SHA256 checksums that may additionally be verified. For more information, see the Verifying the download section of the Installation guide. No, ZecWallet requires a full zcashd node to operate. A light client protocol is currently in development that would substantially reduce the storage and bandwidth requirements for a light wallet. Currently, to use shielded transactions, you need to run a full node. Currently, the blockchain data directory is around 22GB (Feb 2019) and will continue to grow over time. If you are starting ZecWallet for the first time, then you can choose the Advanced Config option and select the desired location of your data directory, which may, for example, be on a separate disk. Move everything in your existing data directory to the new location with the exception of zcash.conf which must remain in the original data directory location. Update zcash.conf to add the line datadir=/your/new/path specifying the path to the newly created folder. The folder should contain the following files and all are (currently) required for zcashd to function. As a workaround, you can use any filesystem operations for your OS, e.g. creating a symlink of the directory, but these are unsupported. No, Zcash requires that you have at least 1 confirmation before sending. Trying to spend unconfirmed funds will result in an error. Yes, though it is advised to use the default 0.0001 fee to prevent your transactions from being distinguishable, you may override this behaviour in the app Options. Transparent addresses start with a t prefix and are transparent like Bitcoin and offer no privacy properties. Sprout addresses have a zc prefix and are the first generation of shielded addresses. Sprout addresses have been superseded by Sapling addresses which have a zs prefix. While Sprout addresses may still be used, it is recommended to use Sapling addresses due to the performance improvements and updated system parameters. To move funds between Sprout and Sapling addresses see the turnstile migration documentation. For more detailed information on the types of addresses in Zcash see this page. Note that on testnet, transparent addresses have a prefix tm, Sprout have a zt prefix and Sapling ztestsapling. Sapling greatly reduced the time taken to perform shielded proofs down to just a few seconds though this value does depend on hardware and the number of shielded inputs/outputs. Sending from a transparent address to a Sapling one is typically completed in under 0.5 seconds. Legacy Sprout transactions take in the order of 70-90 seconds but this is also dependent on hardware and the number of JoinSplits. For more information see this post. By default, the location of the data directory, which stores the wallet, zcash.conf and all blockchain data, is found in the following locations. It is possible to move this data directory. zcash.conf is located in the default data directory and will be in this location even if the datadir parameter has been set to a custom value. Yes, see this section for how to connect to an external zcashd. Not yet. While payment disclosure works on Sprout addresses, zcashd has not yet been updated to support Sapling. There is a plan to support this once implemented by zcashd. Not yet, as zcashd doesn’t currently support Sapling viewing keys and will be implemented in ZecWallet once supported. No, wallet encryption is currently disabled by zcashd. You should use full-disk encryption (or encryption of your home directory) to protect your wallet.dat file at rest, and should assume (even unprivileged) users who are running on your OS can read your wallet.dat file. Like Bitcoin, when using transparent addresses, change from a transaction goes to a new transparent address. ZecWallet allows you to set an option to automatically send this change to a Sapling address via the application Options. As the ‘feature’ was added in Bitcoin as a measure to preserve privacy and prevent trivial linking of transactions on the blockchain, shielded (z) addresses do not have this property and any change is returned to the sending (z) address by default. Yes, by default ZecWallet will store shielded sends locally as zcashd does not provide this information. You can override this behaviour via the Options setting and you can remove any stored transactions at any time by choosing the Clear History button (note that these will not be later recoverable if you delete them). If there is a memo attached to a transaction then it will be visible by a message icon in the transaction listing. Simply right-click the transaction and choose View Memo to read its encrypted contents. No, addresses cannot be removed from the wallet. It is advised that you export the private keys for addresses you are interested in and then delete the wallet.dat file. You can then import the private keys you require in a fresh, empty wallet. No, ZecWallet cannot import private keys from a recovery phrase directly. To do so you will need to extract your private keys from the recovery phrase. You can use a tool such as https://iancoleman.io/bip39/ entering the BIP39 Mnemonic (your recovery phrase) and choosing Zcash as the coin. Once you have entered these values look for the section entitled Derived Addresses which will list all the derived addresses and private keys for those addresses. You will need to import the private keys for any transparent addresses where you have funds, remembering that change in transparent addresses goes to a new address. Access to your recovery seed allows anyone to steal all of your Zcash. Though the tool listed above runs locally in your browser and is fully open source, you can always save the HTML file and run on an airgapped offline device for extra security. Sapling does implement an HD wallet however at present the only way to extract this is to perform the z_exportwallet command via zcashd and is unsupported in ZecWallet due to needing to write to an export directory. To extract the Sapling HD seed you need to run zcash-cli z_exportwallet after specifying an exportdir in zcash.conf. See these instructions for more details on working with the Zcash RPC CLI. Not at present, however, this feature will be added when supported by zcashd. No, ZecWallet is a wallet and full node. While you can configure zcashd to run the built-in CPU miner, this isn’t practical to run on mainnet and you need alternative hardware and software to run. See this page for more information on mining. WinZEC and its predecessor zcash4win (and zcash4mac) have now been deprecated. You can simply install ZecWallet and it’ll use the existing data directory and wallet from any previous installation and operate as normal. Yes, in the Address Book click to Import Address Book and browse to the location of the WinZEC address book file. By default this will be %HOMEPATH%\AppData\Local\ZcashSwingWalletUI\addressBook.csv where %/HOMEPATH% is typically C:\Users\username\ and you may need to enable viewing hidden files to browse to the AppData folder location. Currently, it is available in French, Spanish, Portuguese and Italian. If you want to help by translating see the Translating ZecWallet page. The original wallet was named zec-qt-wallet and was renamed in March 2019 to ZecWallet so any references to the wallet before that date will use the zec-qt-wallet name. The previous name of zec-qt-wallet may remain in places where updating would cause issues with signing releases and upgrades.